« Lost license? Free booze! I could probably use one hand to count how many times it’s snowed this winter since the freak snow-dump in October. Because of this fairly mild, fairly snow-less winter, it’s all the more important that, every time it does snow, we get snow features. To make this photo, which ran as the secondary photo on today’s front, I had to make some quick turnarounds. © 2012 by The York Daily Record/Sunday News. 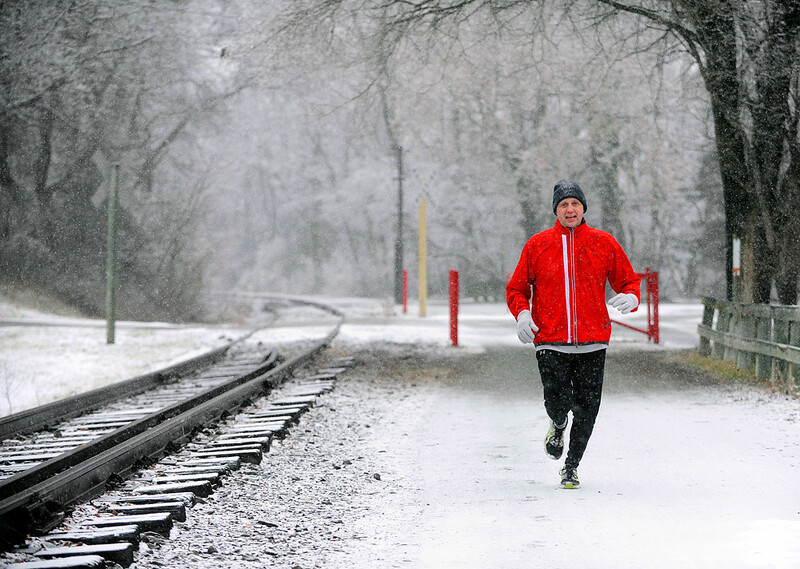 Tom Beck of Springfield Township jogs on the Heritage Rail Trail in Codorus Township on Wednesday, Feb. 8, 2012. Beck, who is training for an upcoming five-mile race in Jacobus, said he runs five days a week and likes running in the snow. "It's so quiet, all you hear is your breath," Beck said. Snowfall was forecast on Wednesday, Feb. 8, 2012, from a coating to an inch. I was taking Rte 616 from Railroad up back to York when I saw this man jogging on the Heritage Rail Trail, which runs parallel to 616 for a little ways. “Man, that’d be a great feature,” I thought to myself as I continued driving. But I was driving in the opposite direction, and parking my car and finding him — and keeping up with him — would be difficult. Especially since 616 is a two-lane road with steep embankments and no shoulders. But… he was running. In the snow. And he was wearing red. Which would contrast really well with the snow. So, next chance I got, I turned onto another street, turned onto another street and turned back onto 616. After that, I wasn’t sure how or where to catch up with the man. The section of 616 on which I was driving at that time is separated from the rail trail by a long stretch of private property. I knew there was a road — Seitzville Road — coming up that intersected with the rail trail. Maybe I could park there and just stay put and wait for him… unless he’d already passed that area. Whatever. I turned onto Seitzville and, as I pulled across the railroad tracks (which give the rail trail its name), I saw the man in red. Running toward me. I’d beat him there, but only narrowly. I parked on the other side of the tracks, jumped out of my car, waved him down, ran ahead of him, made some pictures, talked to him briefly — and then we went our separate ways. Wow! Great determination on your part and well worth the effort ~ incredible image. Love the red against the neutral backdrop. Awesome pop of color! Great job!